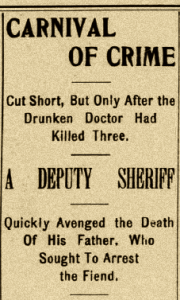 On this date in 1900, Sheriff John Henry Dillingham of Platte County, Missouri, was summoned to the sleepy little town of Farley over a case of multiple murder. 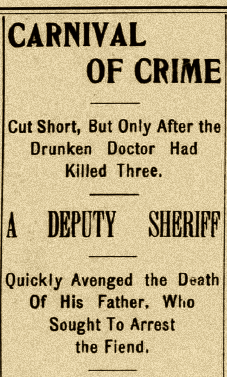 A local physician named Sterling Price “Sturley” Harrington had gone on a day-long, drug and alcohol fueled killing spree. Taking his ten-year-old daughter along on his bloody errands, the doctor shot and killed his mother-in-law in cold blood, then calmly drove to the home of his wife’s uncle and killed him as well. 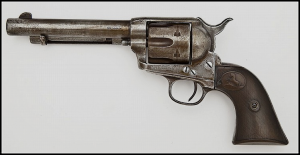 He drove across the state line into Leavenworth, Kansas, where – apparently with further killing in mind – he resupplied with ammunition and more weapons before returning to Farley. This entry was posted in Uncategorized on August 20, 2014 by J.R. Sanders. 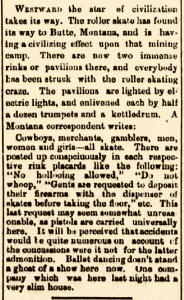 If you’d like to know what cowboys – some cowboys, anyway – did for fun when they weren’t drinking, gambling, and consorting with nymphs du pave, catch my article “Hell on Wheels: When Roller Skating Took Western Towns by Storm” in the current (October) issue of Wild West Magazine. 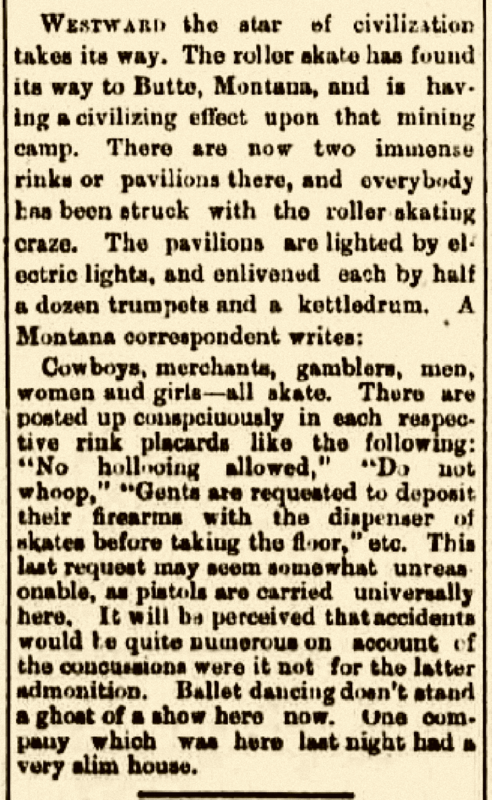 Meanwhile, here’s an article from the March 10, 1884 Omaha Daily Bee that shows how the mid-1880s roller skating craze was taking hold in the wild and woolly West. This entry was posted in Uncategorized on August 12, 2014 by JR Sanders. Our modern Internet memes and urban legends are nothing new. 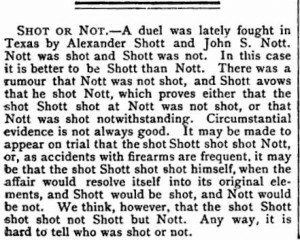 This apocryphal “report” – which many sources credit to Harper’s Weekly – cropped up in innumerable newspapers and magazines from 1867 (the earliest instance I can find) through the end of the 19th century and well into the 20th (I’ve actually found it in the “Sundries” section of a Kennebec, Maine newspaper from 1972). It seems to have started – not surprisingly – in the Western U.S., spread nationwide and, finally, worldwide. 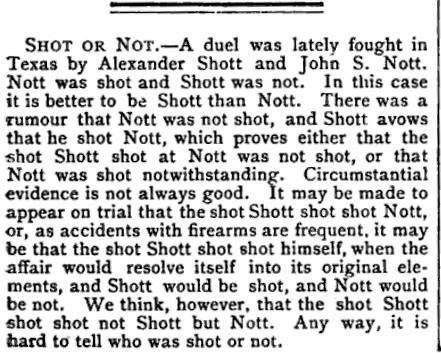 This particular clipping comes from a London magazine dated 1885. Doubtful history, but fun reading. Try it aloud, if you dare. This entry was posted in Uncategorized on July 14, 2014 by JR Sanders. 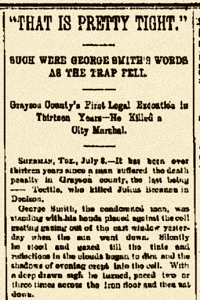 On this date in 1892, George Smith was hanged at the Grayson County jail in Sherman, Texas. 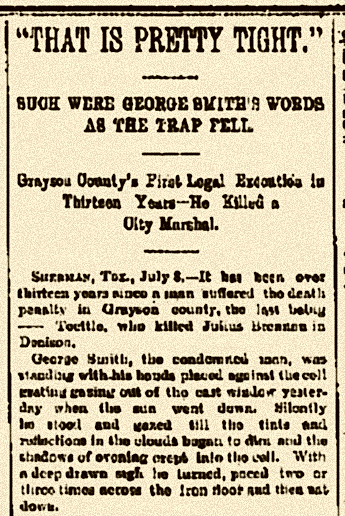 In January of 1891 Smith shot and killed Bells City Marshal James F. Isbell, during a failed robbery in a Bells saloon where the marshal moonlighted… as a bartender. 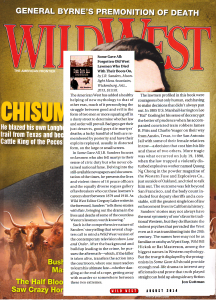 Eighteen months later – after a failed insanity plea, a mistrial, an appeal, and petitions for clemency to the Texas governor – Smith paid the ultimate price for his crimes. Marshal Isbell’s tragic death, and George Smith’s long and winding road to justice, are detailed in Chapter 5 of Some Gave All. This entry was posted in Uncategorized on July 8, 2014 by JR Sanders. 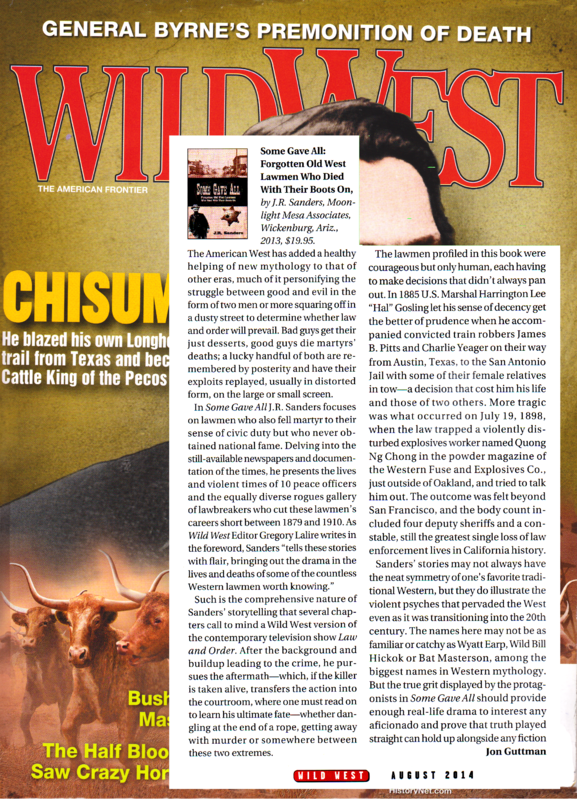 Many thanks to Jon Guttman and Wild West Magazine for the terrific review of Some Gave All in the August issue of Wild West – available now. See my “Reviews and Awards” page for the full text. This entry was posted in Uncategorized on July 7, 2014 by JR Sanders. This seemed an appropriate topic for my first post on my brand-new blog. Still recovering from a terrific – if tiring – five days at the WWA Convention in Sacramento. It was great to catch up with so many old friends, to make a passel of new ones, to attend informative panels and presentations, and to cap off each day in the Roundup Room. I just wanted to take a moment to give a shout-out to the WWA leadership and the hardy band of volunteers who worked so hard to make all this happen. And thanks also for all you do throughout the year (so much of which happens behind the scenes that it doesn’t always get the recognition it should) to make WWA one of the best organizations around. An outfit like WWA is only ever as good as its leadership, and we have the best of the best. My hat’s off to you, one and all. Thanks. This entry was posted in Uncategorized on July 2, 2014 by JR Sanders.